OSWEGO — A SUNY Oswego faculty-student team is trying to help preserve a Native American language, Kiowa, with only about 10 fluent speakers remaining. A faculty-student team will document an ongoing project to create a pilot dictionary to help preserve Kiowa, a Native American language with only 10 fluent speakers remaining. 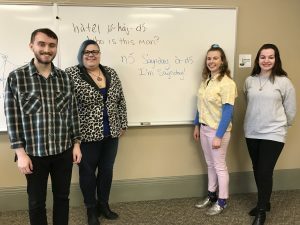 Showing some sample Kiowa phrases are, from left, student Ian White, linguistics faculty member Taylor Miller, and students Lillian Talmage and Autumn Schunk. Not present for the photo was Cory Becker-Warren, another student member of the research team. SUNY Oswego’s Endangered Languages Laboratory is part of a multi-site research project — also including Kansas State University and the University of Oklahoma — to create the first comprehensive dictionary for Kiowa. Miller started the process while a doctoral student at the University of Delaware, and saw the need for preserving Kiowa as urgent. For more information on SUNY Oswego’s Quest symposium, visit www.oswego.edu/quest.